How much has the taint from the Financial Pacific brokerage house and the Banco Universal spread into Panama’s banking and securities sectors? 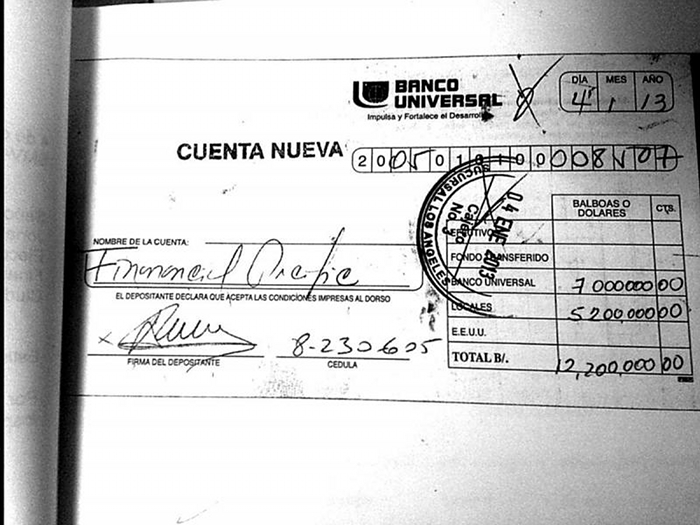 Who gets Banco Universal — oligarchs with Martinelli ties or Miami Nicaraguan exiles? Are the powers that be annoyed with the way that the process of finding a new owner for Banco Universal is going? On October 12 the Banking Superintendency’s secretary, Gustavo Villa, held a bid reception ceremony from which reporters were excluded and after which he quickly left without answering questions. The appointed interim manager for the intervened bank, Jaime De Gamboa, was a bit more responsive. He said that of 49 entities invited to bid for the scandal-plagued bank, only two had submitted offers, that a committee would be reviewing the proposals and that a decision would be made by October 28. The two potential buyers are Panama’s relatively new Canal Bank and the Miami-based Nicaraguan-American company Latin American Financial Services Group (LAFISE). Both were invited to bid, neither is on its face a mob operation, but both raise distinct sets of nagging questions. …large projects related to the Panama Canal expansion, the nationwide road infrastructure network, government development projects of great magnitude; as well as big energy works and major companies such as Claro Panama, Constructora Santa Fe Limited, the Metro Bus consortium, FCC, Acciona, Conalvías, CUSA and Transcaribe Trading, among others…. The road construction company that blockaded La Prensa to retaliate for unflattering news coverage? The controversial hydroelectric dam industry? One of the companies in the problematic GUPC consortium that got the new locks contract on a lowball bid? The bus company that was recently kicked off of the job after many problems? Businesses that were showered with the Martinelli administration’s largess? Maybe big business has to deal with big business and those are the insurance clients NASE has to claim. And besides, Canal Bank has aimed at the micro-finance sector so far. But are we to be impressed by surnames? Capital Bank is headed by former diplomat Roberto Alfaro, and notice the Alfaro surname on the Banco Universal board of directors, Eloy Alfaro. And should the Financial Pacific scandal and a Bolsa de Valores securities market in which there seems not to be much relationship between the underlying value of things and prices make a warning flag out of a securities industry tie? NASE’s treasurer, Roberto Brenes, until recently headed the Bolsa de Valores. Indignant as people who trade on them might get about such a notion, associations work in both positive and negative directions. The illustrious families associated with Banco Universal — the Virzis, the Pérez Balladareses, the Alfaros and the rest — may be in denial now, but that connection was once waved around as an in-crowd credential. The banking authorities are going to have to look carefully at both the reality and the appearance of the Capital Bank bid. LAFISE, essentially run by the Nicaraguan Zamora family, is more straightforward and more at arm’s length in its connections. Founded by Nicaraguans who fled the 1979 Sandinista Revolution, they offer a variety of financial services in Central America, the Dominican Republic, Venezuela, Mexico and the United States. Its president, Roberto J. Zamora, is a US citizen and a substantial contributor to the Republican Party. A move into Panama’s banking sector would seem to be a natural expansion for this group of companies. There is nothing too sinister about Nicaraguan banking and insurance people wanting their part of what could be a major part of the Nicaraguan economy if the project does go ahead. But to Panama that would be “the competition.” In the ordinary course of business having such folks on the Panamanian banking scene would make sense both for them and for Panama. But in the Panama Canal Authority the Nicaraguan canal project is looked at with much fear and suspicion. Panama’s banking sector is well represented on the ACP board and it would be interesting to see how contagious the wary PanCanal attitudes might be within the Panamanian government. So is the Banking Superintendency disappointed that it only has two potential buyers for Banco Universal? Or is it not the number, but that it’s these two, that’s cause for concern?